Mould, bacteria, insects , oxygen and damp all speed up or cause food deterioration and decay. There are numerous ways to protect food from those agents and preserve it for longer periods. For an extensive source of information on the various causes of food spoilage and preserving methods you can visit the survival centre. One preservation method is cold vacuum sealing (unlike preserving with heat and allowing a vacuum to form with cooling). 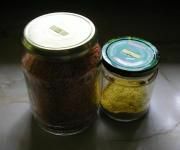 It is a very effective way of preserving a number of different foods and beverages, and can even be used to exclude atmospheric damp from food and non-food items, as long as they fit into a jar. You can recycle most metal lid jars, even a number of other types of containers, as long as they are able to retain a vacuum when the air is pumped out. There are a number of different types of pumps for extracting the air, both manual and electric. As with so much else, the simplest is often the best way, and the simplest tool the most reliable. Two examples of simple, yet highly effective vacuum pumps are the Vacuvin pump and the Pump-n-seal pump . Both pumps work in conjunction with valves which stay on the container to maintain the vacuum. In time air may still enter, and both systems require a little monitoring. Also, a vacuum only delays spoilage, but does not halt it indefinitely. On this page I will describe them briefly, and show you how you can adapt the Vacuvin pump to use on jars, and how to make your own valves for jars for use with either pump. Other pumps may also be used in a similar fashion, as long as they can fit tightly over the valve. Please note that cold vacuum sealing is not a substitute for canning, but is a method used for extending the life of dry goods, and the shelf life of some preserved foods after the container is opened. Please refer to literature on preserving food for more information on what is suitable for cold vacuum sealing. This page is only meant to show the mechanics of cold vacuum sealing. A vacuum does not only delay spoilage, but can also help retain aroma, and is therefore recommended for the storage of things like tea, coffee, spices and herbs. Salty condiments like bullion powder (and salt itself, of course) will stay dry for a long time, greatly increasing its shelf life after opening. I've had it clump within days without the vacuum jar, but keep for a year when using a pump. Biscuits will stay crunchy, crisps remain crisp, stock cubes will not go soggy. Removing the oxygen laden air also reduces oxidation spoilage of fatty foods, preventing rancidity in nuts, seeds and oils. Keep many other things dry, and seeds viable for longer. Note: Bob Matumbe pointed out in the comments that fine powders, even flour, can be explosive. So please do take care what you store and in what form and quantity. Thanks for the warning, Bob. Furthermore the pump can be used to speed up marinading time, by braking the cell walls, according to the pump-n-seal website, who sell large metal discs with rubber seals to use on bowls. And what about the possibility of tenderising the cells of vegetables and fruit before juicing to extract the last possible drop from the pulp? Will a vacuum make sunflower seed shells crack open, and will it speed washing clothes and allow soap and water to get deeper into the fibre using the same principle as the Wonder Washer? Ok, I won't suggest making your own light bulbs (but you could), but there are many applications to explore. The pump does not create a total vacuum though, and I have seen plenty of little grain mites on the inside of a jar with a contaminated batch of	seeds, crawling around oblivious of the vacuum they were supposed to be in. And yes, the lid was well drawn down, a sure sign that there is at least a partial vacuum. You can recycle glass jars with metal lids, which have a rubbery seal on the inside edge of the lid. Proportion and size are not too critical. Make sure they do not have any chipped edges, and that the lid is not dented. The lid has to make contact with the jar edge along its entire length. Rubber seals should not be damaged either. You can experiment with other forms of containers. It must be possible to make a small hole in either the container or the lid by drilling or puncturing. This makes all-glass or all-ceramic containers unlikely candidates, though not impossible. Unless both facing surfaces are precision ground, a rubber gasket is necessary to fill the tiny gaps formed by imperfectly smooth surfaces. The seal can be a separate item or fused with either surface, as is the case with the rubbery inner edge of metal lids of a typical jam or pickle jar. Something worth experimenting with is liquid latex body paint. Containers which lack a lid, or don't have screw top lids can be used with a flat sheet metal lid in a similar fashion to the marinating lids. The surface of the lid needs to be flat, and make good contact with the rim of the container. Drill a hole about 1-2 mm diameter into the centre, filing smooth the edges, and if used for long-term storage, a rubber seal will have to be fused to the surface. Marinading can be done in large jars, and don't need bowls covered with the special lid sold by the pump-n-seal company. The marinading lids sold by pump-n-seal have a separate rubber sheet gasket, but from my experience, it is not suited for long-term storage, as air soon infiltrates. I tried the lid on a very smooth rimmed s/s milk churn for bulk dry storage, but the vacuum never lasted more than a day or so, and I believe the reason was the separate sheet. Bottles need a screw-top metal lid for the sticky valves to work, or a Vacuvin stopper can be used with the Vacuvin pump on bottles with a standard neck size (like wine bottles). The pump-n-seal pump can also extract air from heavy duty zip lock bags with its thin hose attachment (instructions come with the pump). Thin-walled or flexible containers (with rigid lids like plastic milk jugs) which can collapse, porous containers, containers with gaps between the lid and the opening are all unsuitable. The Vacuvin pump uses a special rubber stopper valve for bottles. The pump-n-seal pump uses a small sticky plaster-like valve. It is a narrow strip of plastic with an adhesive backing at either end, but no adhesive in the centre. The valve is stuck over a small hole in the lid, which is pierced with a drawing pin in a standard metal lid. As air is drawn out the centre is pulled up slightly (hence no adhesive in the centre), but the vacuum is also pulling the tab back down on the hole, and as soon as pumping ceases, the sticky plaster remains sucked down to the hole. It is essential that the centre area remains free from dust and anything which would prevent the plaster from making full contact around the hole. Therefore it is also advisable not to overfill jars with powdery content. If the powder is close to the surface some particles can escape when the air is sucked out, preventing a seal to be formed. Pumping is very straight forward, the pump is placed over the small seal and the piston is repeatedly pulled up with the Vacuvin pump, and pushed down with the pump-n-seal (it has a spring to push the piston up again). If the piston resists pulling, its a sign that its working. Draw air until it becomes very hard to pull on the piston. After removing the air, smooth over the little valve with your finger pressing the plastic well into the hole forming a little dent in the plaster. The lid should now be visibly concave. To make your own valves for next to nothing, cut a length of some sticky tape, such as electrical tape and place it sticky side up on the table. Cut a strip of polythene from a shopping bag (or bin bag or whatever source you have - it can be quite thin), about one third the width of the sticky tape and stick it along the centre of the tape. Stick this strip onto some easy release paper, like baking paper, or the backing of some sticky labels (you did save it just in case?). That's it. Cut a strip when required. Valves can be opened many times if the seal is lifted carefully and no particles get underneath. It is advisable to use a tape with good adhesive qualities for more reliable storage. In my experience, electrical tape can vary enormously in quality and adhesion. 3M tape is top quality, if you can obtain it. The Vacuvin pump is a simple barrel and piston pump which is designed for wine bottles using a rubber stopper with a slit valve and placing the rigid barrel over the valve and pulling the piston up repeatedly. The vacuum is released by pressing the rim of the valve to open the slit. It is designed to only works with dedicated valves on bottles. Wine keeps noticeably longer in an air extracted bottle. It may also retain the goodness of freshly made juice for longer by preventing oxidation. A very simple to make adapter can extend the range of this pump to be used on jars in the same way that the pump-n-seal pump is used. Cut a disc of rubbery material (e.g. thin dense foam, such as packaging sheet foam, or inner tube) large enough to extend beyond the edge of the pump base, and cut a hole in the centre about 1 cm diameter. This gasket will prevent any tiny air leaks around the rigid base of the barrel, as there is nothing to secure its tight fit against the hard surface of the jar lid. Place the disc with the hole over the sticky valve centre, position the pump over the disc, making sure it is straight and draw air. It is best not to glue the gasket to the edge of the pumps, so as to be able to use it with Vacuvin's dedicated bottle valves. This pump is available in a number of countries and the basic kit would retail for approximately £10 in the UK or $10 in the US (links to amazon below), and can also typically be found in cookery shops and wine supply shops. Valves can be bought separately. The small investment would soon be recouped in reduced spoilage, and the ability to buy some suitable foods in larger packs or bulk. See update below for a more permanent seal which does not interfere with the use on bottle valves. This pump is also a barrel and piston pump, though in detail it is rather different to the Vacuvin pump. It has a suction foot, which makes pumping easier on flat surfaces, and a special feature is a small stopper which can be removed to attach a thin hose to extract air from zip-lock bags for compact and lightweight storage (e.g. for backpacking). It is designed to extract air from jars through the above described sticky plaster valves. The basic kit sells for about $10 in the US (approx. £5), but additional valves are very expensive for what they are, especially considering the ease and low cost of producing your own. This pump retails from America, direct from the manufacturer, and the high shipping rate raises the cost well above the pure purchase price when bought abroad. This makes the Vacuvin an attractive alternative outside of the US, and maybe is already in your kitchen drawer. Don't believe the manufacturer that you can't use any other valves. I made some, tried them and they work. Although the pump-n-seal products are patented, and selling copies would infringe that right, the information on how to do it, and making it for your own use would not. If pumping offers no resistance, then the air is not being drawn out. Check for dents or nicks on the lid and rim, and also for dust under the valve, and make sure the rim and seal inside the lid are clean and free of any particles. If the jar seals, but the lid pops soon after, or its no longer concave, then there is a seepage, which can be caused by the same things, so check as before, but with more care, as its a smaller flaw. If you can't find any obvious reason, then try various positions of the lid, i.e. replace the lid, pump, leave for a while. If the air got in again, remove the lid, and note the position, then replace the lid by engaging it one notch along. You may have to repeat again. The reason for this is that the rubber seal may have taken on the shape of some slight imperfection, and finding that original position may put the 'positive and negative' together again. This often cures the problem. After pumping a jar, its advisable to leave it on the counter for a few hours. Any seepage is likely to reveal itself in the first few hours, often by an audible pop, though periodic checking is advisable. Sometimes, especially when storing powdery substances, dust gets under the valve, and if a leak is persistent, then changing the valve often helps. If not, the jar and lid may just have too big a discrepancy. When pumping large containers, especially only half full ones, there is a lot more air to remove, so pumping will take longer, and also feels easier to start with. On large jars continue pumping for a little longer before deciding that the jar may be faulty. When storing in bulk, it is easiest to store the bulk in sealed jars, but pour off a small amount into a smaller jar for daily use without the need to pump it every time you open the jar. That quantity may well be unaffected by its relatively short exposure to air and humidity, but having quick access to the content makes this more convenient. The Vacuvin pump with jar adapter, and the Pump-n-seal pump below. Home made valves - electrical tape, easy release paper from sticky label, a strip of valves with a narrow strip of polythene stuck to the centre section. Forgotten jars of seeds and lentils - one, two or three years old. No caking. Marinading lid for bowl with valve. The holes are not essential for the functioning of the lid. I believe they are peep holes to check that the rubber sheet (below the lid) is central. Lifting the valve to show hole in lid. The lid is made of aluminium, and care needs to be takes with vinegar, as it easily causes pitting. Underside of lid with rubber gasket in place, which is adhered to the lid with water. When I get around to it, I will experiment with making a simple pump, but if anyone has information on how to build one to add to this page, I would really appreciate it. Thanks. Here is an idea for making a simple, free contact seal for the Vacuvin pump which does not interfere with the use on the bottle valves. Just cut a few inches of old bicycle inner tube which has a smaller diameter than the pump barrel. Stretch it over the barrel and trim to leave the rubber which curled in over the end. Then trim any ridges with a sharp knife, if possible, otherwise hold the pump a little more firmly down to prevent air from pushing in at those ridges. That is it. The photos show it much better than I can describe. You can easily obtain old bicycle inner tube in various diameters free from bicycle repair shops. The inner tube for the pump was probably from a racing bike or slim touring bike wheel. The rubber will only curl over if the tube is very tight. Harvey F. kindly emailed me these great tips to add to this page. "Hi Judy, I just finished reading your website about the Pump "N" Seal and it is very impressive. I was going to mention about using electrician's tape when I saw you had already mentioned it. I have been using the Pump "N" Seal for many years and have two tips to add to yours. A small piece of paper napkin or towel can be taped to the under side of the jar lid when sealing powders will stop any powder from getting in the way of the seal. Also when you get a lid that won't seal, by running hot air around the edge of the jar lid with a hair blower on hot will soften the sealing compound on the jar lid so it will seat easier. Then give the ring an extra twist. This will work every time. You can do this after the ring is already in place. It is better to put the tape over the hole after heating. Another thing not mentioned was the advantage for survivalists being able to use the Pump "N" Seal in the field because of not needing electricity. Ron M writes to say that Ziplock do an inexpensive pump worth checking out. I have not seen this pump, but I would guess it is designed for use with bags, as Ziplock make self-sealing bags. It may be possible to adapted it to work on jars. Free foraging guide to help you fill those jars with free and healthy food.